In earlier posts about our experiment in Twitter fiction, “Enter the Lodge,” I talked about how social media platforms can sometimes simply be the medium through which you’re telling a story; just because you have different character accounts tweeting at each other, for example, doesn’t mean that you necessarily have to treat it as if those accounts are actual Twitter accounts. Indeed, for “Enter the Lodge,” doing so would have been anachronistic, because our story takes place in 1989, and Twitter would not even be invented until a number of years later. But, in my experience, even when you are using Twitter accounts as actual Twitter accounts, there’s a certain degree of variation from standard Twitter practices, especially in projects that incorporate fan roleplay. The most basic of these boils down to this: Sometimes you have no choice but to have your characters talk via Twitter in situations where, in reality, they’d be having these conversations face to face. And there are different reasons why this needs to be the case. For one thing, if you’re doing a web series on a shoe-string budget, action-heavy, crowd-heavy live-action scenes can be cost prohibitive. But anything and everything can happen on Twitter. For instance, I remember one particular Twitter exchange in “Fury of Solace,” between one of our protagonists, the conspiracy vlogger known as Uroboros, and Damian Durand, security chief of the evil Mason International pharmaceutical company. Durand had tracked Uroboros down, and had surrounded the building with armed security. If we’d had the budget and resources to shoot this live-action, I suspect Durand would have delivered his lines to Uroboros via a bullhorn. But in order to convey what we needed to about the scene, we had to fudge the scene a bit by having Durand and Uroboros converse via Twitter instead. In a series like “The New Adventures of Peter and Wendy” which encourages fan roleplay, we’ve found that one surefire way to keep the fan community engaged is to facilitate what I’ve come to call “Twitter events.” By way of example, in a recent live-action episode of “New Peter and Wendy” season two, Wendy mentioned that she was going to have a signing for her new book at a local Neverland book store. So we decided to host a Twitter event for the fan roleplayers, in which they could pretend to be in attendance for that very signing. Of course, if you were to attend an actual book signing, your interactions with the author would be face-to-face conversations, you wouldn’t be going back and forth with them on Twitter. But for our purposes, since the town (and by extension the book store) doesn’t actually exist, and since our Twitter roleplay fans are not, in fact, in the same geographical area but are instead scattered around the world, our only choice was to have the event play out entirely on Twitter. And in cases like this, our characters and the fan roleplayers involved tweet what you imagine they’d be saying out loud if they were actually physically at the event. Interestingly, many avid fan roleplayers want to develop story arcs of their own, and in order for them to do so, blurring the lines between Twitter and in-person interplay is not just a helpful conceit, it’s actually more or less a requirement. I recently learned that some of the more avid “New Peter and Wendy” roleplayers have real-world Google Hangouts, in which they collectively plot their roleplay characters’ story arcs over the course of our seasons. And this, quite frankly, blows my mind; it’s essentially a microcosm of the kind of meetings that me and the “New Peter and Wendy” creative team have when we’re plotting the transmedia course for any given season. Additionally, I am absolutely certain that some of the roleplayers have multiple, different RP accounts, and spend hours on Twitter essentially talking to themselves, just as I do. Numerous characters have torrid love-affair storylines, for example, that I imagine would be difficult to coordinate between multiple people. And for fans, Twitter is the only storytelling medium they have; they don’t have live-action episodes in which to dramatize the parts of their characters’ stories that would not realistically be played out on Twitter. So in their storylines you’ll start to see stage directions and parentheticals popping up in tweets, bookended by asterisks, like, *blushes* or *Walks into bookstore,* to convey things that can’t otherwise be represented on social media platforms like Twitter. Additionally, I clocked an interesting phenomenon during the second season of “New Peter and Wendy.” This year I actually had a transmedia assistant named Marken Greenwood, who, in order for her to immerse herself into the world of the show, created an RP character of her own. And since part of her job was to track any important fan roleplay developments anyway, we decide that her character would write a gossip column for the local Neverland newspaper, little recaps of what happened virtually in the town from week to week. I mentioned above that several of the fan roleplay stories have romance-novel-level drama, and obviously in real life, those kind of intimate moments would happen behind closed doors, not over social media for all to see. I’m not saying that these roleplay romantic liaisons are sexually explicit (they actually tend to be very PG-13), but we’re still being made privy to encounters that wouldn’t normally be broadcast over Twitter. In some of the early editions of Marken’s gossip column, she would make very reference to very specific details of some of the burgeoning RP relationships, and the roleplay characters involved appeared to be quite embarrassed to have those intimate details broadcast for the entire fictional town to see. Now, it’s a little difficult for me to discern if these roleplayers in question were embarrassed in real life, or if they were merely play-acting the embarrassment that they imagined their characters would feel in this kind of situation. But it got me to thinking; amongst the roleplay community, there seemed to be an unspoken understanding that some of their RP exchanges were, in fact, private moments. But these unwritten rules aren’t delineated anywhere, this really kind of developed organically, and was just intuitively understood by the roleplayers. Another thing I’ve realized after doing this for a few years is that you don’t need to make your characters be as prolific online as real people are on their social accounts. In other words, as a normal person, your social media feeds are probably littered with random bits of ephemeral minutiae that are not important enough to be included in the story of your life; and you don’t necessarily need to include those kind of character-building status updates for your fictional character accounts if those updates don’t particularly advance your story. You might get a troll or two asking, “How come this side character only ever tweets when they have something to contribute to the story?” but for the most part people won’t even notice. Your audience knows these characters aren’t real people, so it’s really not important for you to keep up the illusion that they are. And you can actually reach a point where the signal to noise ratio gets our of balance. By way of example, let me tell you a little about The Flashlight, a conspiracy blog kept by the the aforementioned “Fury of Solace” side character, Uroboros. 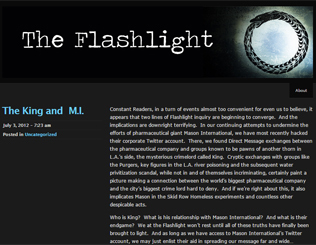 This was the first transmedia project I ever worked on, and at the time, I was a little two hung up on making The Flashlight read like an actual blog. So we had literally years of backdated posts, the great majority of which had very little to do with our ongoing plot line. And here’s the thing: studies have shown that only a relatively small percentage of your audience is going to engage at the deepest level of your transmedia experience. And that being the case, it would be an even smaller percentage still of people who would engage to the level of forensic fandom necessary to pore over dozens and dozens of tangentially-related blog posts with the hope of finding a nugget of story-relevant data. We buried the signal within a massive amount of noise, and quite possibly drove away some fans who were daunted by the prospect of going down so deep a rabbit hole. But, hey, if you’ve got the manpower and the wherewithal to give your characters a digital footprint that rivals that of a living, breathing person, you’re welcome to try! But it can, ultimately, be more trouble than its worth, and possibly even be off-putting to fans who don’t have the mental bandwidth to engage with all of that content. So if you want to play in this kind of social media sandbox as a roleplayer, or create one like it for a project of your own, keep in mind that you’ve got some leeway when using social media accounts for storytelling purposes. If telling a better story means using a social media account in a way that strains credulity, you should do what’s best for the story, every time. Stay tuned next week for an entire post about fan roleplay projects.